Most developments in the new year will be focused on environmental, public health or safety needs, yet manufacturers of refuse collection vehicles (RCVs) and their accessories will be eagerly addressing these to maintain compliance with new legislation and gain a competitive edge. Growing concern over the impact that particulates and nitrous oxides have on our health have put a replacement for diesel fuel top of the legislators’ wish list. Various alternatives have been mooted, but an electric vehicle, with the potential for all the power to come from renewable sources, is the ultimate goal. And the world’s first all-electric RCV, the Li-On Power Pro, will be unveiled by Geesinknorba at Future Fleet Forum, in London’s Guildhall, in January. Both the chassis – built by Dutch electric vehicle specialist Emoss – and the body are powered by lithium ion batteries. Mick Hill, UK business director of Geesinknorba, said: “We’ve been producing hybrid vehicles for more than a decade with bodies powered by batteries but mounted on diesel-fuelled chassis. Now, thanks to our collaboration with Emoss, we have produced a vehicle powered entirely by batteries. “Electric vehicles aren’t just about zero emissions. They are more energy-efficient as there’s no revving-up the engine needed for the lifting, compaction or tipping mechanisms. Consequently, they are much quieter too. They have fewer parts to go wrong and so are less prone to wear and tear and potentially cheaper to maintain. And there’s no diesel or AdBlue cost. Energy efficiency was one of the cornerstones in the design of the new vehicle's body. Hill continues:“Put all this together with the cleverly designed chassis and we have a vehicle that is totally suitable for waste collections in urban environments with characteristically short journeys between collections and shorter overall routes. The successful introduction of three-weekly collections by several local authorities is also having an impact on RCV design and fleet make-up. A Local Authority Recycling Advisory Committee (LARAC) conference recently heard how East Devon achieved a 69% increase in recyclable materials collected and a 26% increase in food waste after introducing three-weekly collections. And when Rochdale went three-weekly, recycling increased by a third and food waste four-fold, knocking residual waste down to 27%. If three-weekly regimes lead to cost savings, better recycling rates and less landfill, they are likely to become more widespread, but this means they need fewer vehicles than weekly or fortnightly regimes. Volume of different recyclable factions will also be larger, so purchasing vehicles with design specifications or modifications for particular waste streams, such as those dedicated to food waste, may become more viable. Numerous safety devices will develop in the year ahead, with the pick of them being live video streaming and remote access for operators. But it is safety standards which are perhaps most significant. The Fleet Operator Recognition Scheme (FORS) standards will continue to be adopted across the UK, but another initiative that will have a significant impact on RCV design and the safety systems required in 2018 is Transport for London (TfL)’s Direct Vision Standard (DVS). While still in its formative stages, it originally set out to ensure drivers had clear and direct vision through their windscreens and doors but has since evolved to embrace the use of vehicle safety devices. Designers are already incorporating larger windscreens and glass door panels to help drivers see pedestrians and cyclists, but DVS will use a star system to rate HGVs from zero (lowest) to five based on how much a driver can see. Vehicles with one star or more would get a permit, but those rated zero would need additional safety devices. However, whatever standard is set now, the bar will only be raised in future. DVS is set to be introduced in 2020, but such is the pressure on operators to reach the highest safety standards that new RCVs in 2018 are bound to be ordered with a high DVS spec. Many older vehicles will also be retro-fitted and modified too. And while this legislation will only apply to London (the EU is preparing similar, though less stringent, legislation), such initiatives have a habit of spreading. The buoyant hire market will ensure its RCVs comply with TfL’s requirements, and the pressure will be on other operators to match that. Other safety features set to emerge in 2018 include the addition of dust suppression systems to RCVs and the use of anti-drink-driving kits. These require the driver to take a breathalyser test before starting the engine. 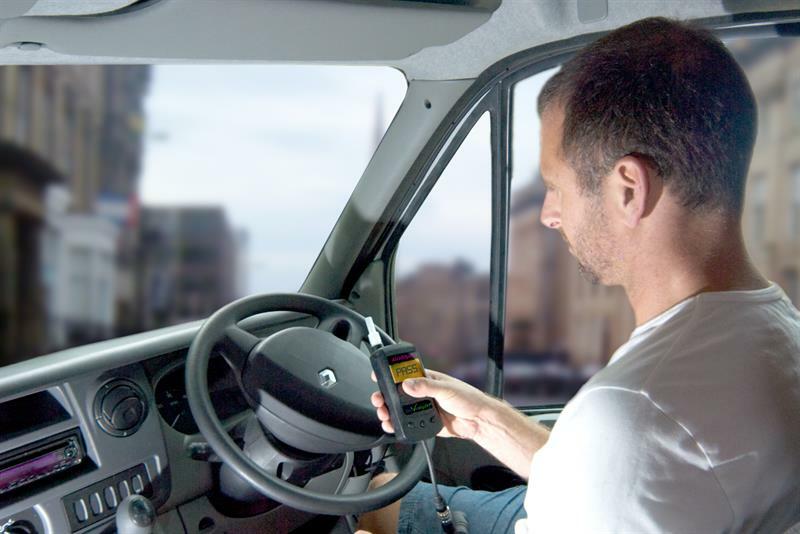 AlcoDigital and Renault Trucks have already shown off the Draeger Interlock 7000 and made it a special offer with selected vehicles. The last word on safety goes to Middlesbrough Council, which recently fitted Ident, a radio frequency tagging system from Vision Techniques, to prevent unauthorised drivers and stop its RCVs being used as weapons by terrorists. Others may follow. Another design trend currently gaining traction is a move to make RCVs less intimidating and more public-friendly. While aesthetics come into play here, manufacturers are also developing vehicles with a smaller footprint. And this is not just about public perception but practicality. Geesinknorba and Dennis Eagle already offer narrowtrack RCVs, but Dennis Eagle has just revealed a prototype for another. The goal was to reduce the weight and size of the vehicle, making it quicker on tight, urban rounds while still carrying significant payloads. What it has produced is an innovative 16-tonne vehicle with a potential payload of eight tonnes, which it describes as “an integral chassis-less construction”. The wheels are smaller, giving it a lower centre of gravity and allowing even easier access to the cab. The tight turning circle makes it more manoeuvrable and there is more room for payload as, with less gross weight, the vehicle doesn’t need such a big motor. The prototype is reportedly powered by a relatively small four-cylinder, 4.5-litre diesel engine, but rumour has it that an all-electric lithium-ion-battery-powered model, and a compressed natural gas CNG model, will be produced. When? Expect them before 2020, say the rumours, which means they could be another landmark of 2018.